Outdoor is a place to do various fun activities at the same time, especially when your kids are with you! 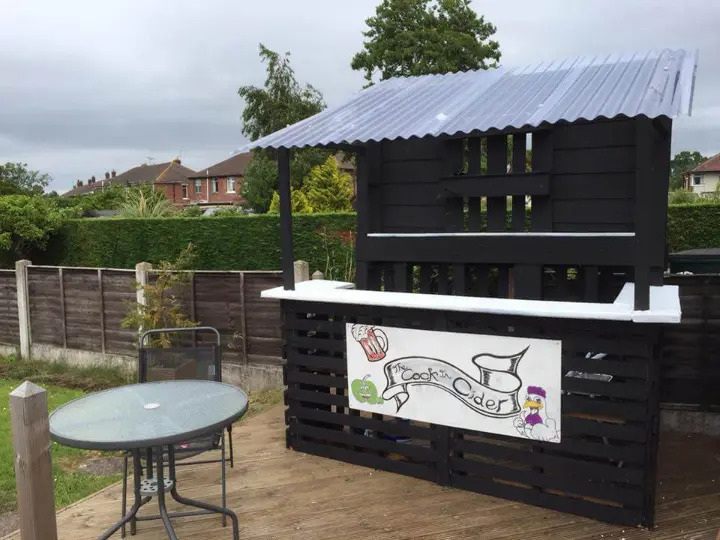 So while relishing the outdoor in dead of summers, every one feel thirsty so addition of a drink corner become necessary for your paved outdoor and garden to be over enjoyed with cold beverage anytime! 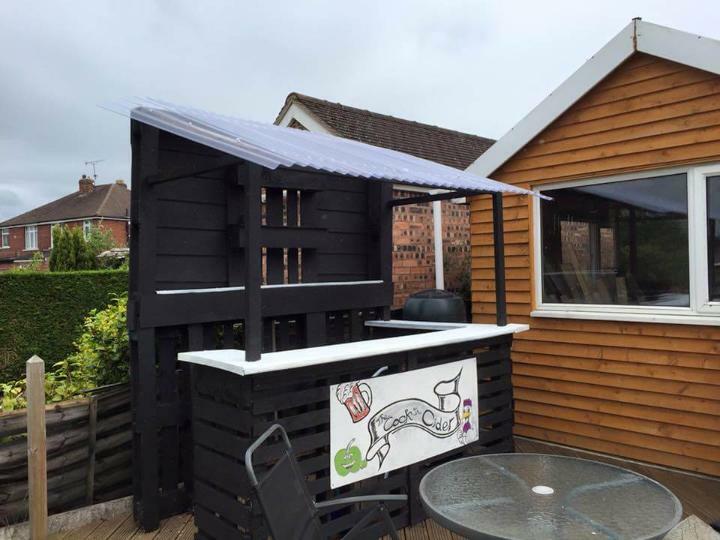 Here is a DIY pallet outdoor bar or drink point inspiration, comes with an enchanting rustic table with mind-blowing counter space, displayed in black and white! To provide shelter to the inside person, a special sloping metal roof has been made which has further been supported with two wooden pillars fixed at the DIY pallet counter top! Dominant black is a perfect color for wooden projects to be outdoor friendly and avoids them to get weathered early! Rear of this pallet bar has been build by constructing a vertical DIY pallet wall having lots of shelves and compartments to hold your beverage bottles! 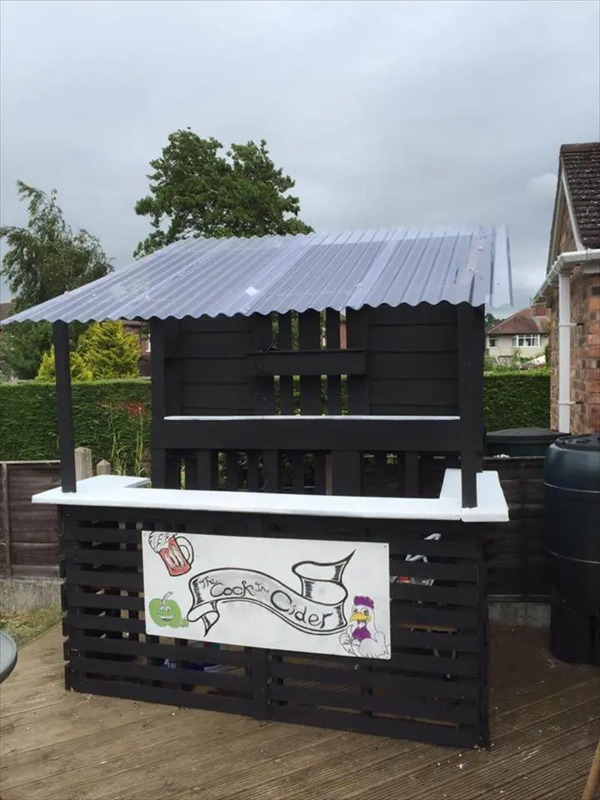 It can also be used as a stand or a little shop to sell kids-made food items and drinks at some special events! Built a vertical pallet wall by joining 2 or more pallets in upright position, Add a meal roof and attach its rear tightly to pallet wall using the hardware! Also build a pallet counter and support the front of the roof by fixing two wooden supports at very corners of the counter! Give a name to your dink point and carve the name letters to tag at its front! If are an artist then you can design various patterns and shapes to give it a personal look! Stain has been used to give a durable finish to this drink point! Choose any of chest nut, espresso, mahogany, dark or light walnut or minwax stain according to the pallet wood species and change its tone to any you like the most! Here minwax stain has been used for a protected black appeal also goes friendly to outdoor and patio! You can also make you own comfortable seating with pallets, now here you find unique collection of 104 Pallet Sofa designs for inspire your outdoor and indoor furniture.